Chairman of the Presidential Advisory Committee Against Corruption, Prof. Itse Sagay, SAN, has said that Igbos were intimidating President Muhammadu Buhari with the Biafra agitation in order to get appointments. Sagay, who came down hard on proponents of the agitation of Biafra Republic, said they were doing so for selfish reasons in interview with Daily Independent. According to him, the agitation for Biafra became so serious after former President Goodluck Jonathan’s tenure, adding that those clamouring for a new country were doing so in order to intimidate Buhari. 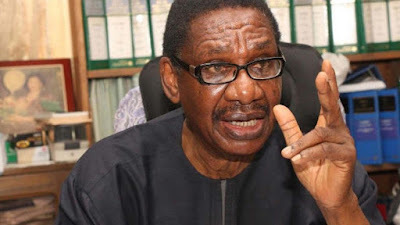 Sagay described the Igbo as die-hard loyalists of Jonathan, and noted that the Igbos, who occupied 50 percent of federal positions in the country under the Jonathan administration resorted to rigging for the PDP in the last general elections. He said, “I have been studying elections very closely in this country since 2007. The Igbos were committed to Goodluck Jonathan. But they didn’t leave it at that just convince people to vote for him. "They decided to rig for PDP and Jonathan. They did that yet, the party still lost out at the federal level. So, they lost out. "If you look at Jonathan’s government, the Igbos were in almost 50 percent of positions in this country. But they lost out because of their rigging and opportunism and lack of principle.